Pool repair & resurfacing in Boca Raton, FL will keep you sane this summer as this area is known for its unusually hot weather, so why not cool off this season and get the pool service you need to get the most out of your pool experience! Acid Wash – a simple, yet highly dangerous pool cleaning solution to be carried out by trained professionals to gently strip the thin top layer of pool plaster exposing the fresher plaster underneath. Remove dirt, grim, stains and years of algae bloom practically overnight for less than a fraction of the price to pool resurface. Commercial Pool Maintenance -- your pool is likely seeing a lot of activity throughout the day and needs to be serviced to maintain quality safety standards. Eco-Friendly Pool Equipment -- with the advent of green chemicals, cleaners, pumps, filters, lighting, heating and purification systems you are guaranteed a great deal of savings on your heating and electric bills this year with the installation of our top of the line eco-friendly equipment. Heat Pumps -- 5x more efficient than gas pool heaters, heat pumps consume little wattage in comparison to keep the costs of heating a pool during the cooler times of a season such as early spring or late fall to a fraction of its normal costs. 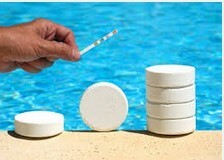 Lead Detection and Repair -- although pools are designed watertight, naturally, sealants deteriorate over time. They leak through fittings, accessories, plumbing and the shell itself. For this reason we recommend calling professional leak detection experts to help save on your water, heat and chemical costs. Property Maintenance -- If you travel often, we can monitor your property. If there's a major storm coming, we can secure everything down. If there's been a major storm we can clean your pool and yard of fallen debris. And if your pool or patio deck needs cleaning we can pressure wash it. REO/Foreclosure Services -- are you a real estate agent, investor, flipper, house hunter, bird dogger, or anything in between? 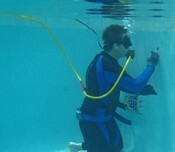 If so, you need a professional pool restoration company to quote you affordable pricing. Residential Pool Maintenance -- this service consist of sanitizing and balancing your water pH levels, cleaning skimmer basket, checking the automatic cleaner, scrubbing walls, steps and floors as well as skimming the top of your pool surface for debris and various insects. Resurfacing and Restoration -- we use some of the highest quality exposed aggregate surface material such as River Rock and Diamond Brite, amongst others, to give your pool the upgraded finish you were searching for. Salt Systems -- with our salt system you can wave "bye bye" to leaky chlorine jugs, irritating skin and the putrid smell of chlorine. Swimming Pool Light Fixtures -- if you want to host parties and impress family, friends and guests, what better way to do so than to upgrade your pool lighting fixtures with color-coordinated LED lights to set the mood in your own backyard? Swimming Pool Safety -- you can prevent a number of dangerous incidents from occurring by choosing to install a pool safety feature to give you peace of mind.